AUGUSTA, GA. – Clemson broke a 2-2 tie with two runs in the sixth inning on its way to a 10-2 win over Maine in the second game of a doubleheader at Lake Olmstead Stadium on Saturday afternoon. The Tigers, who swept the doubleheader and the three-game series, improved to 4-2 on the season. The Black Bears dropped to 1-6. The Tigers trailed 2-1 before Reed Rohlman’s sacrifice fly in the fifth inning tied the score. Clemson took the lead for good with two runs in the sixth inning, highlighted by Weston Wilson’s go-ahead, run-scoring single. Clemson added two insurance runs in the seventh inning thanks to a two-out error and four more in the eighth inning. 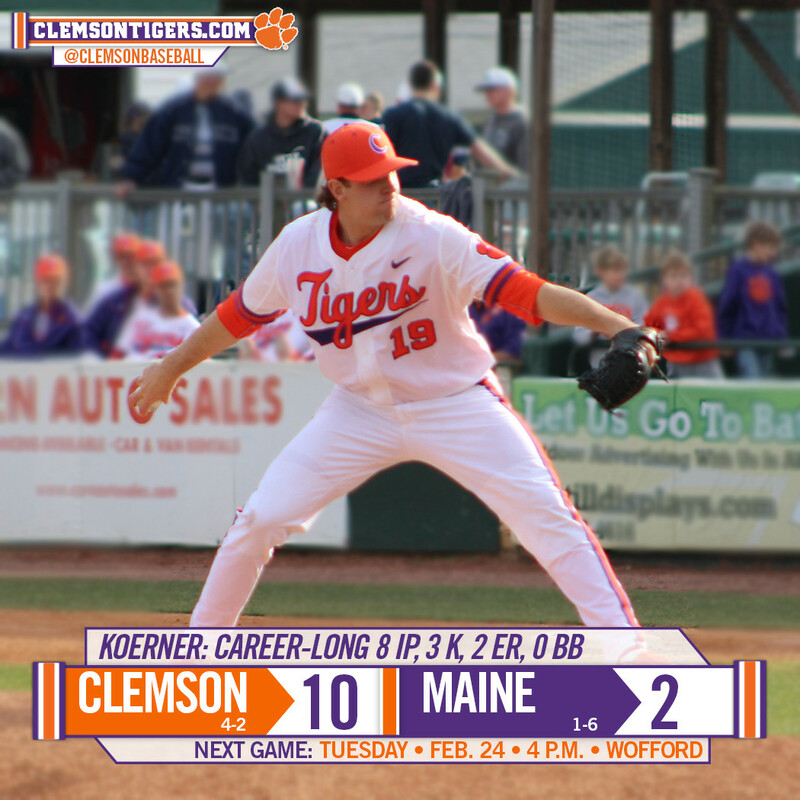 Starter Brody Koerner (1-1) earned the win by pitching a career-long 8.0 innings. He allowed eight hits, two runs and no walks with three strikeouts. Maine starter Justin Courtney (0-2) suffered the loss. Clemson returns to the diamond when it hosts Wofford on Tuesday at 4 p.m. It is Tiger Cub Tuesday, as any IPTAY Tiger Cub Club member who presents their Tiger Cub ID at Doug Kingsmore Stadium receives free admission when accompanied by a paying adult.